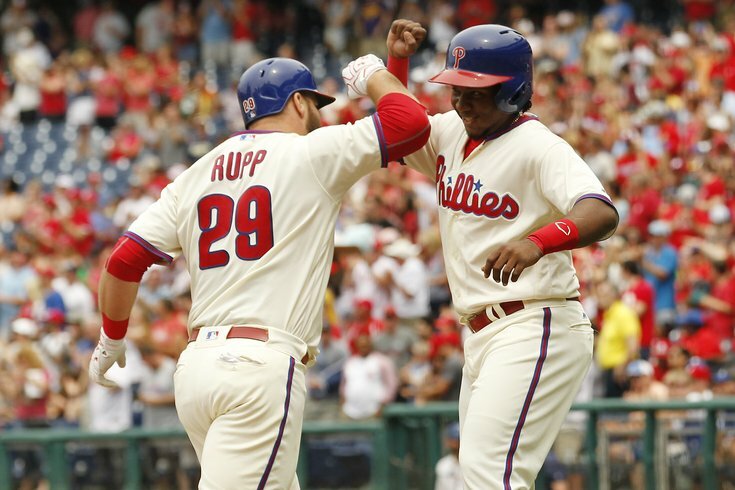 Philadelphia Phillies' Cameron Rupp, left, high-fives Maikel Franco after hitting a three-run home run against the Kansas City Royals. Prior to Sunday, the last time Vince Velasquez stepped onto the mound at Citizens Bank Park he was removed after throwing just two pitches. On Sunday, against the reigning World Champion Kansas City Royals, Velasquez was visited by a member of the training staff, pitching coach Bob McClure, manager Pete Mackanin, and the whole crew of Phillies infielders after throwing just five pitches. "Oh no," Mackanin thought to himself as the crowd gathered around the mound. "Not again." "It was kind of weird," said Rupp, the first to greet the pitcher. "After the first hitter, I went out there and just questioned how he felt. ‘What’s the deal? You have nothing behind it.’"
Velasquez spent 2 1/2 weeks on the disabled list with a biceps strain after his two-pitch outing lat month. On Sunday, Velasquez’s fastball velocity was markedly down. None of his first five pitches registered higher than 90, which is about five clicks lower than where it’s sat for the season’s first three months. But Velasquez looked at Mackanin, Rupp, and everyone else on the mound and reassured them he was completely OK.
"I looked at them dead in eye," he said, "and said I was fine." Instead of another early exit, Velasquez remained in the game. He eventually found his fastball at times, although it never regularly hovered in the mid-90s. The 24-year-old made up for it by deftly mixing up his pitches, fooling the Royals hitters with an array of breaking balls and changeups to complement his secondary heat, and ended up giving the Phillies six strong innings, his longest start in more than seven weeks. Cameron Rupp and Cody Asche supported Velasquez with a pair of booming home runs in the game’s first three innings as the Phillies beat Kansas City, 7-2, taking the series from the defending world champs. "I’ve been in situations like this before," Velasquez said of not having his top fastball. "But this was pretty much one of my biggest games, especially against a championship team like that. Again, location is the key. It’s beneficial, it’s going to help you out in the long run. It was pretty big today." After going 6 1/2 weeks without winning a series, the Phillies have won two in a row. They’ve also won six of their last eight games overall. Velasquez’s return to the rotation has coincided with the team’s hot stretch. Six days after delivering five shutout innings in Phoenix, striking out seven without walking a batter, Velasquez sent a scare through the ballpark early but then made nary a mistake for the next six innings. The only blemish on Velasquez’s line was a two-out, two-run home run to Alex Gordon that cut the Phillies lead to 4-2 in the fifth inning. But that was all the offense the Royals could muster on Sunday. Velasquez retired 10 of 12 batters he faced between the end of the first inning and the beginning of the fifth. He gave the Phillies a shutdown, 1-2-3 inning in the second after Rupp’s three-run home run a half inning earlier. After Cesar Hernandez helped erase a leadoff base runner an inning later on a double play ground ball, Velasquez dug into his repertoire and located his good fastball. He framed a 95-MPH pitch on the outer half of the plate with two strikes on Royals second baseman Whit Merrifield. Home plate umpire Toby Basner didn’t like the pitch. So Velasquez responded by spotting a knee-bending curveball on the same spot and Merrifeld badly flailed at the pitch for strike three. In the fourth, Velasquez dialed up 96 MPH twice to record his fifth of seven strikeouts he’d end up with on the day. But rearing back and finding his regular heater wasn't a regular occurrence on Sunday. "Things happen," Velasquez said after volunteering that his fastball his 97-MPH six days earlier, in his first start off the disabled list. "Everyone has dead arm at some point. But that’s the game of baseball. You’ve got to pitch. You’re not going have your stuff all the time so you’ve got to pitch, you’ve got to utilize your pitches, utilize all of your stuff. And today worked pretty well." Lacking his best fastball on Sunday may have been beneficial to Velasquez in the long run because it forced him to mix up his repertoire of pitches better in an effort to keep Kansas City's hitters off-balanced for six innings. "Extremely important," Mackanin said. "He just did such a good job with his secondary pitches – his two-seamer, his changeup. ... I think he probably learned a lot about himself by going through that and having to pitch that way." "He pitched – he didn’t throw," Rupp said. "He pitched. He gave up one mistake and it really didn’t hurt him. He had the lead and he went out, left a pitch up in the zone and a good hitter got him." The first inning mound visit was worrisome. But Velasquez was able to make everyone forget about it to collect his seventh win of the season. "Location is the key," he said. "I mean you’ve got Greg Maddux, Jamie Moyer, guys who barely threw 85. If you hit your spots, you can never go wrong." • Cameron Rupp won’t be named to the National League roster when All-Star teams are announced this Tuesday. But he probably deserves to be in a conversation (and not totally snubbed by people who watch him regularly). Rupp’s first-inning, three-run home run off Kansas City right-hander Yordano Ventura was his eighth of the season. Rupp is one home run away from tying his 2015 total. Rupp hit nine home runs in 81 games/299 plate appearances last year; he has eight in 51 games/201 plate appearances this season. "That ball he hit to right field was about neck high, which was nice (because) he’s been concentrating on not missing fastballs up in the zone, which are home run pitches for him, by trying to stay on top of those pitches," Mackanin said. "It certainly looked like he did that today." Rupp’s .831 OPS, meanwhile, ranks third among major league catchers with at least 150 plate appearances this season, ahead of the likes of San Francisco’s Buster Posey (.823) and Kansas City’s Salvador Perez (.806). Only Milwaukee’s Jonathan Lucroy (.842) and Washington’s Wilson Ramos (.957) are better. "I’m playing well, whatever that means," Rupp said. "I’m happy with my performance and I’m showing what I can do and hopefully, it proves I can belong here." Rupp is hitting .299 (41-for-137) in 37 games since the end of April. • Maikel Franco hit his 14th home run of the season, tying his output from his rookie season a year ago. Franco hit 14 home runs in 80 games/355 plate appearances in 2015; he has 14 in 77 games/287 plate appearances this season. Franco finished Sunday 3-for-4 to raise his season slash line to .258/.315/.453. Franco has multiple hits in five of his last six games. Franco is hitting .378 (17-for-45) with three home runs, three doubles, and a triple in his last 12 games. • Dalier Hinojosa was activated from the disabled list on Sunday and then optioned to Triple-A Lehigh Valley. Hinojosa has been sidelined since April 29 with a right hand contusion.